Greg: All right we’re back. Jason good to see you. Jason: Good to see you man, welcome back. Greg: Thank you. Last week we were talking about kitchens and you really got my mind racing a little bit. 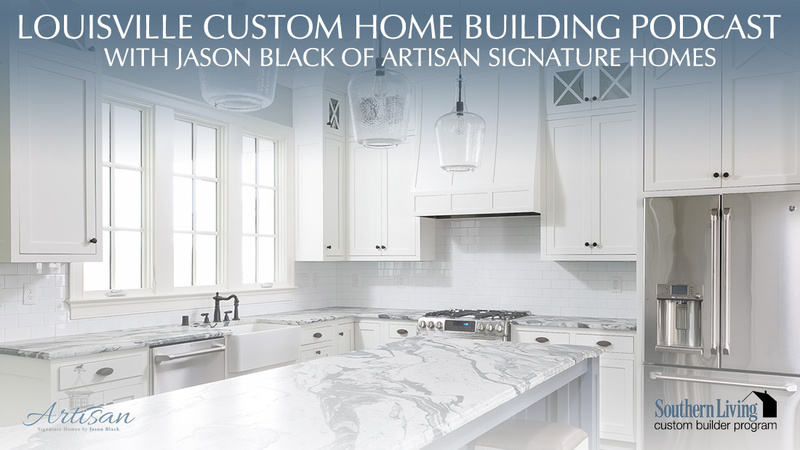 I’m sure when you sit down to talk to someone about custom homes you have a-I don’t know if you have a literal list, but maybe a little checklist of sorts to go through some of the best things to talk about or think about when putting together a kitchen. Do you mind if we go through a list like that today? Jason: Yeah, let’s do it. We typically have a nice setup that we ask our clients what they like in the kitchen. We can go through out top requirements in a new kitchen. Greg: That would be great. Let’s act like I’m a client of yours and we’re going to-walk me through a kitchen. What are some of the things I need to think about? Jason: Okay, so the number one that I like to incorporate in all my kitchens is some form of a pantry. The preference is an actual walk-in pantry. Jason: Yeah, a separate room that’s direct access from the kitchen and typically it’s going to have wooden shelves that are built either by a company like the Closet Factory or Closets by Designs, something like that. Or a lot of times I can just have my trim carpenter build but the important factor is that it’s wood shelving. Wire shelving just doesn’t seem to work in a pantry. Greg: You like the idea of a separate room verse cabinets out in the kitchen, is that a function of the size of the homes you build or is there a functionality reason that that works better? Jason: I’m a big fan but we do a lot of bulk buying, there’s bigger boxes, bigger cartons. Sometimes those items just don’t fit in a typical cabinet. If you have a pantry, a larger bottoms shelf you can get a box of popcorn or individually packaged chips and just slide those into the shelf and pull them out as needed. Greg: It turns into practicality and functionality. Jason: Yes, and also the size of the homes we build, you know although they’re not all mansions, I mean we build homes starting just under 2000 square feet. For example I’m working on a plan for a Homearama 2016 in Norton Commons. The house is just over 2000, about 2100 square feet and we’re going to have about a 4 by 8 walk-in pantry right off the kitchen. Greg: Oh that’s wonderful because it seems nowadays that so much family time is spent in the kitchen that it looks like people are making that kind of equation in their mind, I’d rather have a little bit more room in the kitchen where we all spend time together than … They probably don’t even notice it being taken away from somewhere else. Jason: No, you’re absolutely right and again it helps keep a family organized. If they can keep all their cereal, all those canned goods all in one spot it just makes for a better lifestyle. Greg: All right, so what’s next after a pantry? What else do I have to think about? Jason: Lighting is very important in the kitchen. You want to have good overhead lighting but one of the things that sometimes people overlook is under counter lighting. You do a lot of tasks on the counter tops in the kitchen. It’s very important to have, I like the LED or Zion lighting. It’s a nice bright light that can do those daily tasks because you’re preparing your meals. Greg: You sort of went away from what I think was popular 20 years ago with the single fluorescent bulb under the kitchen that sort of buzzed at you when you came downstairs at night. We’re not going that anymore? Jason: Yeah, Greg we’re going to have to get you a new house I think, so yeah those are a little bit historic. Jason: Yeah, new technologies and energy efficiencies have come in with lighting and full effect right now. Greg: Sounds good. What’s next? Jason: We touched on this a little bit in last week’s episode but when we’re designing a new kitchen I really like to have a connection to the outdoors. This is accomplished a couple of ways. If we can have a sink with a window over top of it, I’m always the dishwasher in the family. I love to sit at the sink or stand at the sink and look out at the window so it brings that natural light. The other connection I really like to have is with some type of door or way to get from the kitchen to the outdoor space. The kitchen’s always that hub of the house so people are always coming and going. If you’re out grilling or going outside, I always like to make an entry and exit point through the kitchen. Greg: Maybe I’ll take this a little bit outside the kitchen but I mean that sounds great. Do you try to have the grill in mind or the outdoor cooking area in mind when you’re building a house to facilitate that transition from the kitchen to the outdoor grilling area? Jason: Absolutely, absolutely, so sometimes it’s either a connection through a covered porch or a covered overhang. If you’re grilling and want to come in and out you don’t have to get wet if it’s raining. Jason: Yeah, the outdoor space is definitely taken into account with the design of a new kitchen. Greg: Okay, so already the kitchen is affecting the design of rooms coming off the kitchen and you like to make sure that you can transition from one to the next without it being-you like the flow and functionality of the whole house to come together obviously. Jason: Yes, absolutely, it’s all those little puzzle pieces are taken into account when we put the big puzzle together. Jason: I like it, absolutely. Greg: Okay, so back to reality or what we’re doing here today. What are we on number four? Greg: It’s not the same is it? Jason: That’s right, so hopefully he’ll come back home again soon. Greg: You need to find a way to get the gas line to the kitchen though for the appliance. Jason: That’s correct. The next one is going to be number five and it’s the soft close drawers. They’ve really become popular and really it’s a must have. It’s a standard feature in our luxury custom homes we do. The only downside is nobody knows when you’re mad because you can’t slam the drawers. Greg: That’s what the door is for right? The door to the outdoors. Jason: That’s right, but yeah it’s a soft close. It’s very nice sliding drawer and usually I like mine with a dovetail construction so it’s a real solid box. I get a lot of requests to fix friends and families drawers including yours Greg, that has come off and broken. Yeah, if you have that soft close drawer in a dovetail construction it should be a nice long live drawer. Jason: It’s the way the box is constructed so instead of having-there’s four sides to a drawer. A lot of times like a stock kitchen if you went to Lowe’s and bought some cabinets they may be just nailed at the corners and the two ends aren’t really connected. It’s like a mortise and tenon joint where you cut out the ends and they slide together so it’s just a very tight way to build a box. Greg: Last week we talked about-I’m going to forget the names, the inset cabinet doors that you said took up a little more space, were a little bit more expensive. With these soft close drawers, is that the same kind of concern. Do they take up more space? Do the rails-or is it just, it’s just a nicer drawer and I’ll never notice as the homeowner. Jason: Yeah, the only differences with an inset cabinet, your cabinet’s typically going to be about an inch or so deeper just because the drawers are inset to make sure … I’ve heard horror stories about people building custom kitchens and they didn’t make their cabinets deeper to account for the inset so you want to have an experienced kitchen designer designing your kitchen. Jason: Yeah, in no particular order the top five so far of must have’s in a new kitchen. Greg: We’ll come back next week and you have five more for us. Jason: I will do it.